Viola M. Schreiner, 87, of Garay Lane, Port Washington died Monday, September 1, 2003 at Wisconsin Veterans Home in King, Wisconsin where she had been a resident since May, 2003. 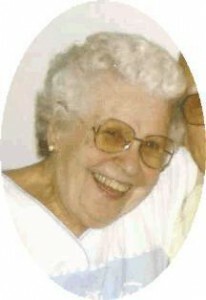 She was born May 26, 1916 in St. Killian, Wisconsin to George and Mamie Grahser Lanser. She grew up on a farm in Fond du Lac County. On May 30, 1939 she married Edgar Weyker of the Town of Port Washington at St. Mary’s Catholic Church in Lake Church, town of Belgium, Wisconsin. They resided in Port Washington. For 27 years she worked for the former Badger Raincoat Co. in Port Washington in quality control. She retired in 1978. Her husband Edgar preceded her in death on February 24, 1965. She married George J. Schreiner of Port Washington at St. Mary’s Catholic Church in Port Washington on October 3, 1970. Throughout the years Viola has been active with the Lady Catholic Order of Foresters and St. Mary’s Christian Women. She enjoyed gardening, playing cards and baking. She will be remembered by the 100’s of mittens she knitted for the needy every year, as well as, the afghans and quilts she gave to family and friends. She is survived by her husband George, two sons John Weyker of King, WI and Tom Weyker of Sturgeon Bay, WI; step-children Marlene (John) Kultgen and Mark (Lonne) Schreiner, both of the town of Port Washington; grandchildren Noel Weyker and John Carlson, step-grandchildren Kelly Schowalter, Steph and Tony Schreiner and great grandchildren Cassie and Cody Keller. She is further survived by sisters-in-law Betty Lanser of Elkhart Lake, Grace Lanser of Belgium, Evelyn Lanser of Port Washington, Mary Poull of Port Washington, Helen Large of Town of Port Washington and Betty Weyker of Grafton, other relatives and friends. She is preceded in death by her first husband Edgar and three brothers, Arnold, Sylvan “Syl” and George Lanser. Funeral services 7 PM Friday Sept. 5 from the Poole Funeral Home, Port Washington to St. Mary’s Catholic Church, Port Washington for Mass at 7:30 PM. Reverend Allan Sommer will be the celebrant. Interment will be in the parish cemetery. Visitation will be from 4-7 PM Friday at the funeral home with a 4 PM rosary. Memorials to St. Mary’s Church appreciated.